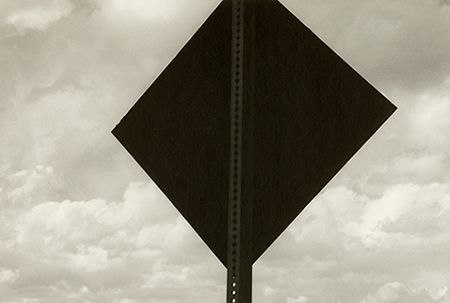 Bill Timmerman, “Black Sign, New Mexico,” silver gelatin print. Longtime Phoenix artists and friends Larry Kornegay and Bill Timmerman share an aesthetic of “do more with less” — Kornegay through found-object and cast concrete sculptures and Timmerman through modestly scaled, atmospheric black-and-white photographs. Kornegay’s work is the more whimsical in the way that it re-imagines mundane objects and simple building materials. In “Rock, Paper, Scissors” the charming conceit is an oval gray rock, an oval wad of paper and what appears to be a rusted industrial blade grouped like museum artifacts inside a three-sided frame. “Le Collezioni” hangs from the ceiling, almost like a tasseled lamp, with a confection of primitive ceramic heads, slices of cactus skeleton, and a Sponge Bob toy, all draped with dog-tag chains. In “Knob Bowl,” glass door knobs appear jewel-like embedded in a cast concrete bowl. Timmerman is equally intent on mining ordinary objects and ordinary scenes of the West to elicit contemplation. His mastery of composition is evident in a work like “Black Sign, New Mexico,” with its silhouetted image against ethereal clouds, perhaps to evoke isolation or aimlessness. Similarly, “Abandoned Pump House” shows just that, but the visual interest lies in the simple lines that bisect planes in this stripped-down yet elegant composition.